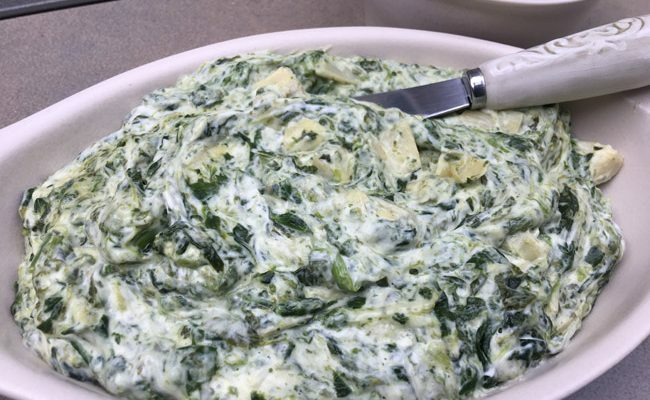 Spinach Artichoke Dip| Spinach Artichoke Dip is a perfect game day treat. My cousin Merry Anne is the oldest of us cousins. I’m not going to say that she’s spoiled or anything but her elder state did come with some privileges. For example, she didn’t have to take the everyone-in-the-tub baths that the rest of us had to endure as youngsters. Merry Anne always got first dibs on the quilts at my grandma’s house and of course, chose the silky one and not the itchy wool ones. She had a height advantage and could pelt us better with rotten apples from her apple tree battle station. She still leads us in fine eats as exemplified by this incredibly yummy spinach artichoke dip. Merry Anne was always ultra-glam and her advanced age of being three years older than me gave her an edge in the fashion world. 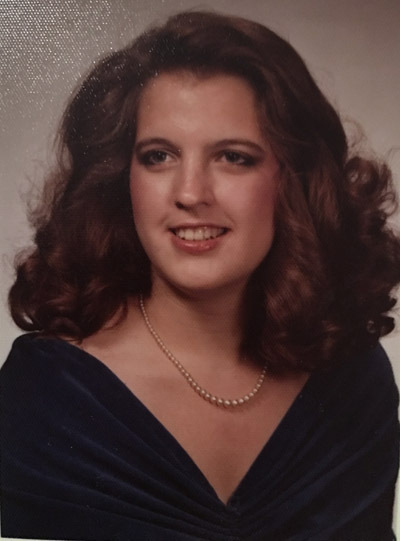 Here she is sporting pearls for her senior portrait. 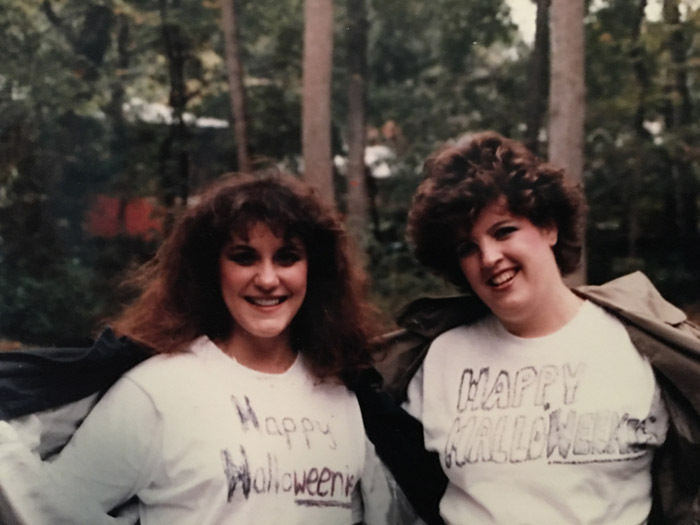 A few years after the senior photo we got together to go to a Halloween party. People are still talking about our costume twenty-five years later. It was indeed a good one, but I’ll have to leave it at that. Last weekend we gathered to attend my uncle’s memorial service in South Carolina. He was an animal lover, golfer, and successful businessman. 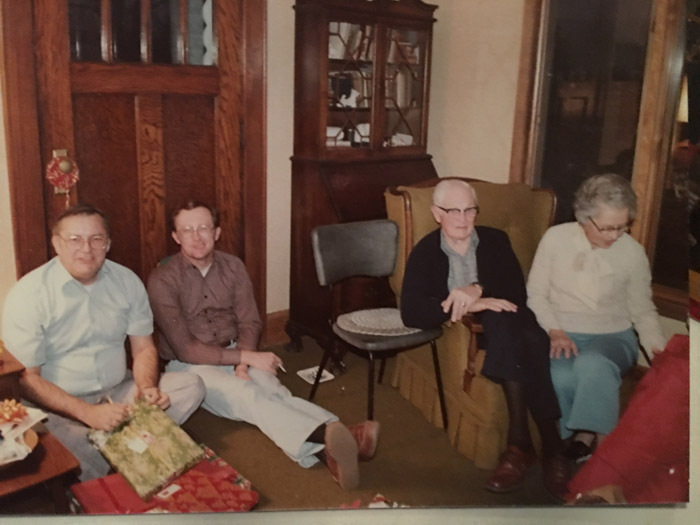 Here he is with my dad as they share a chuckle and say “cheese” for my camera at our family Christmas party around 1980. Don’t you just want to jump back into old photos for a minute or two and soak up the moment? Although it was sad to say goodbye to my uncle, we were able to relish family time, recall fond memories, and of course, share our love with those who know us best. Merry Anne served her spinach artichoke dip as we sat around my aunt’s kitchen table last weekend. I wanted to post it here because it now reminds me of the importance of bonding as a family through shared foods and experiences. To me, when I exchange a recipe it helps me to connect with others in a lasting way as I make that food and remember the stories and love behind it. Soften the onion and garlic in 1 tablespoon butter or oil. Cook spinach according to package directions; drain the two packages of plain spinach. Add spinach and artichoke hearts to onion and garlic. Cut cream cheese into small squares and add to spinach along with the mozzarella cheese; stir to combine. Heat until cheese melts over low heat and serve warm with bread or crackers. I will eventually get the old ones back on there. They are still embedded in the blog posts but not individually in the recipe section. I’ll keep working on it.